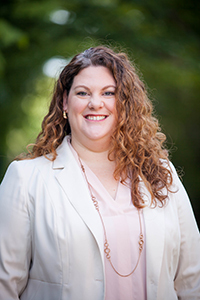 Katie Peterssen is an experienced strengths-based counselor and currently serves as Assistant Director, Career Development in Meredith’s Office of Career Planning. She has more than 10 years of experience in higher education working with students to identify their natural talents, values and interests, and developing plans to achieve academic and career goals. Prior to joining Meredith, Peterssen worked at NC State University and UNC Chapel Hill supporting student career development. Additionally, she has worked in student recruitment at NC State University, The University of Alabama and Worcester Polytechnic Institute. She has a M.Ed. from NC State University, is a nationally certified counselor (NCC) and a Lincensed Professional Counselor Associate (LPCA).